A busy few days, Dad goes bionic, Mags goes mermaid. We moved into Loughborough on Friday and stayed there for the weekend. A dry but cloudy and cool day. 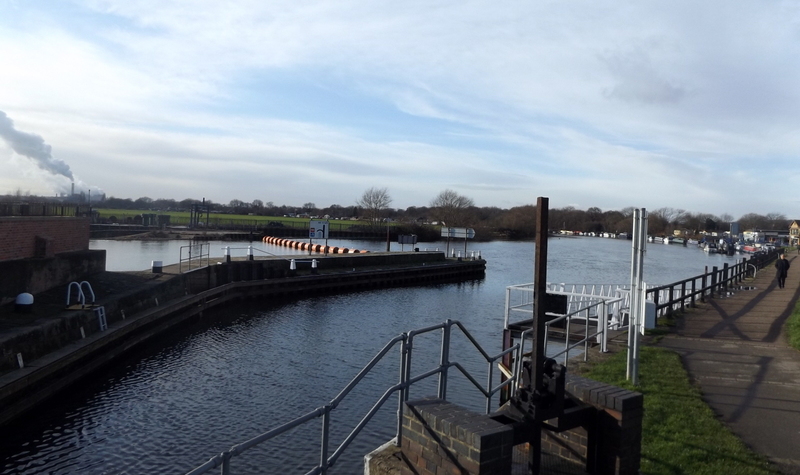 The short cut has the lock at the downstream end and two large weirs and a flood control barrier at the upstream end. Normanton on Soar Church, St. James’. There are good moorings for The Plough Inn just upstream. If you look closely you’ll see he has his little dog on his lap. 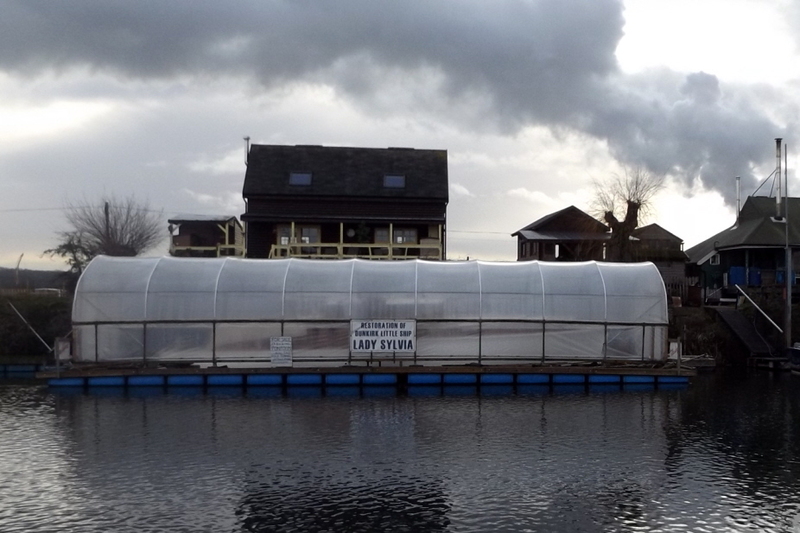 Bishop Meadow Lock House is for sale, around £400k. The sanitary station has been replaced by a summer house, but there’s still a (very slow) water tap and rubbish disposal above the lock. After topping up the tank we carried on, up Loughborough Lock and around the corner to moor on the bank just past Chain Bridge. Ahead is the terminus with moorings and services, to the left, under Chain Bridge, is the main route towards Leicester. The Loughborough Navigation, based on the River Soar from The Trent to Loughborough, opened in 1780 and ended at the terminus near the town centre. 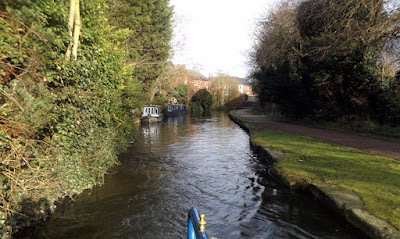 The route was extended to Leicester by 1794, this section known as the Leicester Canal. A few years later the Leicestershire and Northamptonshire Union Canal was started, intending to link Leicester with the Nene at Northampton. By 1809 it had managed to reach Market Harborough, but the finances collapsed. At this time the Grand Junction Canal was well under way, heading north past Northampton towards Braunston, so the decision was made to abandon the original Nene destination in favour of linking with the GJC. 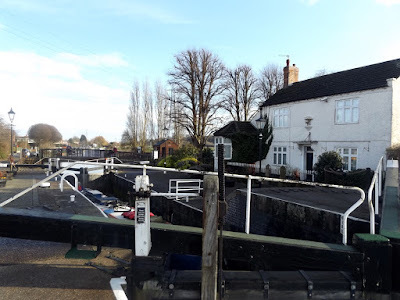 This modified route gave us the impressive locks at Foxton and Watford and joined the Grand Junction in 1814. Unfortunately, to save money, it was built to narrow gauge, effectively preventing wide boats from running up to Leicester from London. Shame, really. 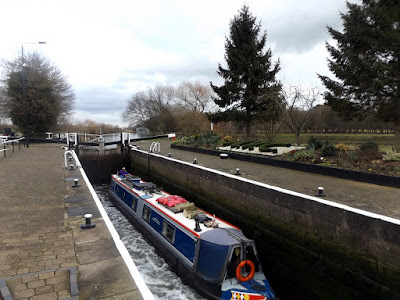 We stayed in Loughborough for the weekend, then headed a couple of miles further on to moor in Pillings Lock Marina for a few days. Leaving Loughborough on another bright, brisk day. The hosiery mill alongside Nottingham Road, dating from the late 18th century, ceased operation and was most recently occupied by 3M. It’s now undergoing another reincarnation as apartments. Just about to turn into the marina, dazzled by the low sun. We got set up, then I went off to collect a car from Enterprise in Loughborough. Dad had been in hospital since Friday having a new knee installed, and we didn’t expect him to be discharged until Tuesday, but they were happy to let him go early. So I dropped Mags and Meg off his house to keep step-mum Ann company while I went to collect him. He’s doing ok, it’s a fairly routine op now. Got to be better than before, he had no cartiledge left on the bearing surfaces in the joint, just bone on bone. He should have had it done earlier – much earlier. Then yesterday, Tuesday, we went north. Not the best day for it, with rain, sleet and snow. But we had to go to Mag’s doctor’s to get a follow-up blood test. The one she had done at Newark was cocked up, Loughborough Hospital flatly refused to deal with it – “Not from our area, sorry”, so we decided to go up to get it done. 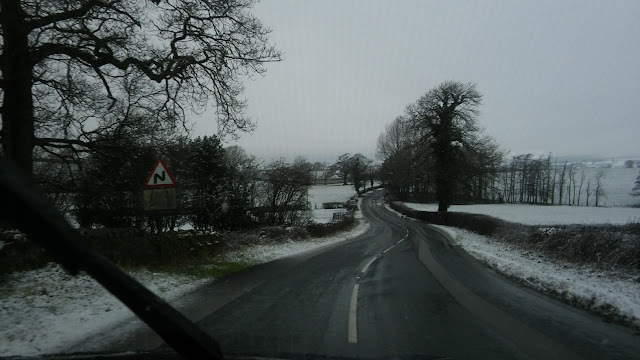 It snowed while we were up in the dales, but the main roads were clear and the snow turned to rain as we headed back south. Not a fun trip but it could have been worse. The temperature dipped to -4° last night leaving a skin of ice on the water and frost on the boat roofs. Another sub-zero night tonight, we’ll wait until it thaws a bit then move out. Not far though, we’ll hang around this area for a week or two. This weather is stunning at the moment, after a sub-zero night we’ve had a fine sunny day, even warm at times. We lost the sun earlier on though as it rose behind the plumes of vapour from Ratcliffe Power Station. Redhill Marina is a mixture of businesses based in porta-cabins and sheds. And lots of moorings which snake around to Ratcliffe Lock. Passing through Kegworth Shallow or Flood Lock, another left open during this quiet period. Above here the water levels have been lowered to help alleviate periodic flooding. This lock was of conventional use and depth, now this is effectively on a level with the pound downstream, and the next one up, Kegworth Deep or New Lock, is very deep. Kegworth Deep Lock, with the steeple of St. Andrew’s church rising above the trees. By the time I‘d got the chamber emptied another boat had arrived to join us on the way up. They were welcome, with a single boat in there you have to take it slowly. But they were also disappointed to find that we were not going all the way to Loughborough today. 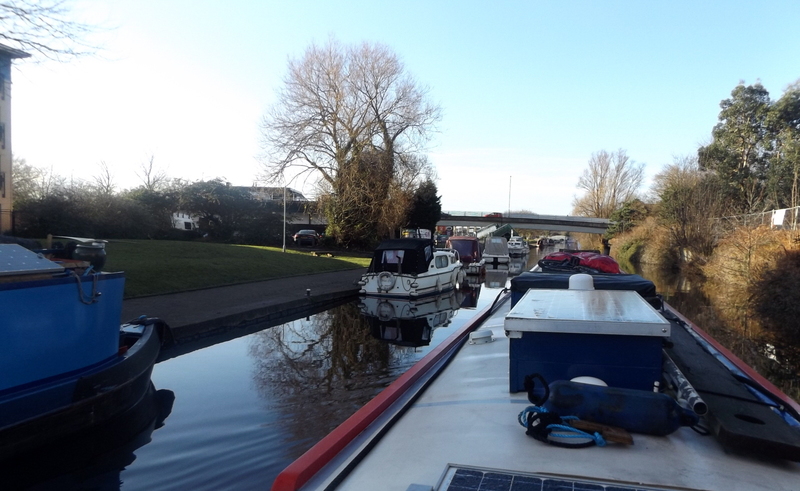 We moored just a little further on in a fine sunny spot with a comfortable towpath height. We’d picked up a few logs the other day, and some more today, so had pulled in earlier in a remote spot to get them sliced up. Tomorrow it’ll be a chopping and stacking day, then we’ll toddle off into Loughborough on Friday. Cold again tonight, and less sun tomorrow. It was good while it lasted. Back out of town, up to Trent Lock. We were not sure whether or not to move on today, but the sun was shining out of of clear blue sky, and the cyclists were whizzing along the towpath. Decision made, then. I made another visit to Sainsbury’s for perishables, then we shoved off. Passing Mick and Pip, NB Oleanna. We been keeping an eye out for each other, and had a chance for a chat while we were here. They’re staying around a while before heading north. What is now known as the Nottingham and Beeston Canal, running from Meadow Lane Lock to Beeston Lock, was originally two independent navigations. The Nottingham Canal was opened in 1796, linking Langley Mill at the head of the Erewash Canal to Nottingham and then to the river at Meadow Lane. 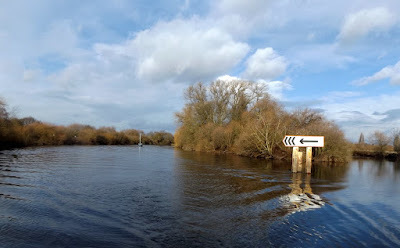 It was intended to transport coal produced in the North Nottinghamshire coalfields more directly than the previous roundabout route down the Erewash Canal and the Trent. 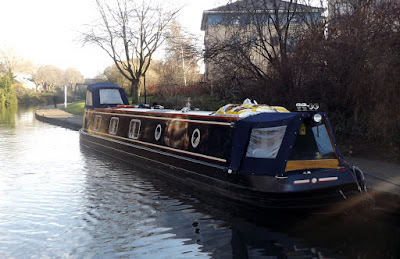 With a connection to the Cromford Canal it could also be used to carry limestone from the quarries and cotton from Cromford mills. Concurrent with the Nottingham Canal’s construction the Trent Navigation Company built the Beeston Cut, running from the river at Beeston and joining the canal at Lenton. To prevent unauthorised boats coming down the cut and onto the canal, the Nottingham Canal Company padlocked a chain across the canal at the junction. The site is still known as Lenton Chain. The section of the canal from Lenton to Langley Mill fell into disrepair, was closed in 1937 and is now mostly filled in. The Beeston Cut is different in character from the Nottingham Canal, being wider and deeper. It leaves the city, skirting the Boots Estate and the suburb of Rylands before connecting with the river again at Beeston Lock. A six-inch rise up from the canal to the river was all we had today, with the river being quite low. Looking upriver from Beeston Lock. Back on the river again there’s a pleasant 5 mile stretch to Cranfleet Lock where we leave the river again for the short cut which bypasses the large Thrumpton Weir. 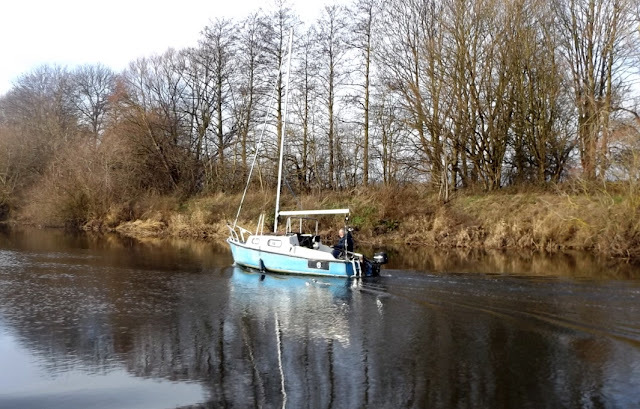 We passed a small sailing boat just out for the day, chugging upstream powered by a little outboard. 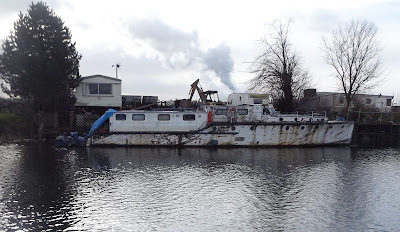 He’d left his mast up so was pretty sure he wouldn’t be joining us in Cranfleet Lock. Lovely but chilly out on the river. Ratcliffe Power Station generates it’s own eco-system, but at least it masked the bright, low sun for a while. …and there’s another candidate for the treatment just a little further up. Cranfleet Lock, about a 10 foot rise on this one. At the far end of the cut, where the junctions of The Trent, The Soar and the Erewash Canal all come together, we pulled in for the night. The clouds had started to roll in and we had a drop of rain late afternoon, but none of the sleet and snow they talked about. Not yet, anyway. I forgot to post a picture of the slalom course alongside Holme Lock yesterday, so here you go. This is the lower half. It was busy yesterday, quieter today. We left at 10:00 this morning, followed by Mick and Sue on – blast, I can’t remember the name. Anyway, we met them up in Skipton and they’ve followed the same route as us, arriving at Holme last afternoon. But, and here’s the difference, we left Skipton on December 19th, 33 days ago, they left Skipton a week last Friday! What’s that, 10 days? To put us to shame even more, the Annual Talisker Whisky Atlantic Challenge has been finishing over the last few days, and the winning crew, from The Netherlands, completed the 3,000 mile journey in 34½ days. The British Team finished today after just under 40 days. The record was set last year by a crew from London, and stands at 29 days and 15 hours. It’s about 3 miles to Meadow Lane Lock, which takes the navigation up off the river and onto the Nottingham and Beeston Canal. 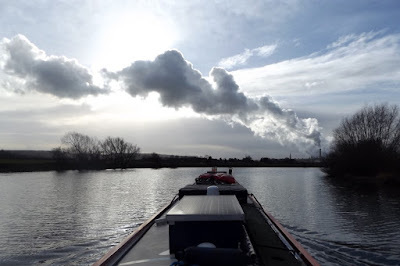 We’ve not seen a moving boat for the last fortnight, but, as we toddled along upstream, we were slowly overtaking a barge that must have left the moorings ahead of us. Typical, isn’t it. The first lock in ages that won’t fit all three of us is ahead, so we’ll have to queue! But then, amazingly, the skipper of the barge turned around and headed back downstream, giving us a cheery wave as he passed. 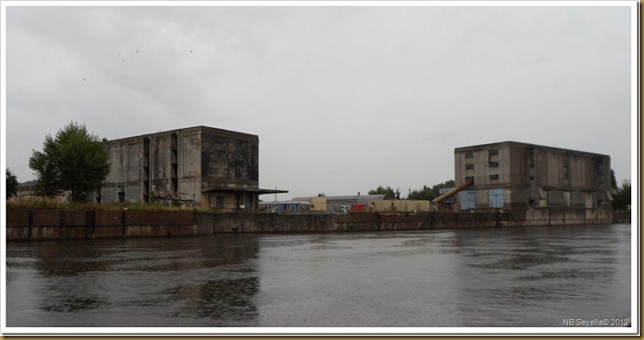 The old British Waterways warehouses on the north bank were a bit of an eyesore, almost Soviet in their aesthetic appeal. I wrote about them here. But now the area is in the process of being redeveloped, know as Trent Basin, and is well on. 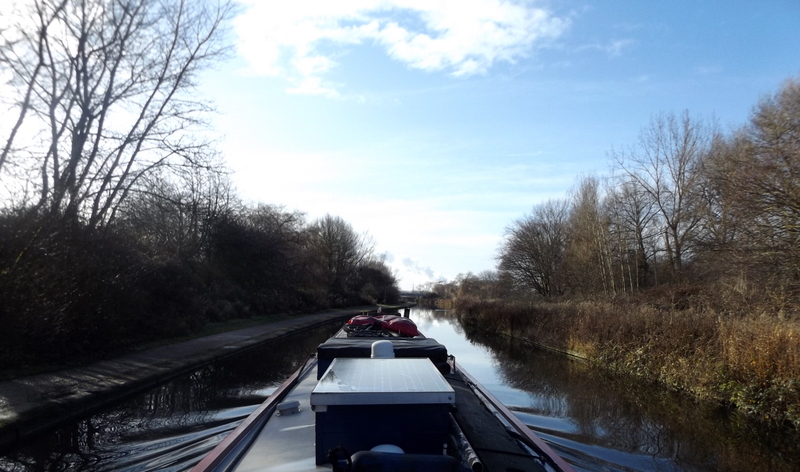 Meadow Lane Lock, dead ahead. Nottingham Forest’s ground is to the left, Trent Bridge further up river. 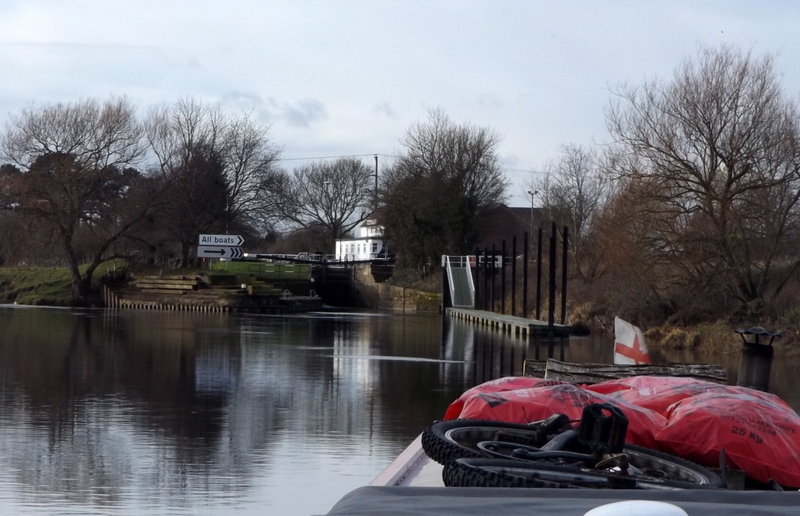 We struck lucky, the lock was empty with the gates open, so both boats were able to go straight in. It didn’t take long to fill the lock and then we parted company. We needed to fill with water, our temporary traveling companions wanted to push on to get to Sawley today. The two miles into Nottingham are a bit of a shock after spending the last couple of weeks on the open vistas of wide canals and rivers. Not least because you have to wind the paddles up and open the gates manually! We pulled up outside Sainsbury’s, on the long stretch of visitor moorings. It’s not as busy here as I thought it would be. Depending on the weather we’ll either have a day here, or press on to Trent Lock tomorrow. Tom, if you're reading this, thanks for the tip re posting the photos. It worked! Off the tideway a day later than planned. Cool and windy on a lonely river. Bramwith Junction for the weekend.